The Japanese whiskies in ParisThe Japanese whiskies have now their own shopwindow in Paris (6 Carrefour de l'Odéon 75006, along the street going up to the Luxembourg). The major whisky retailer La Maison du Whisky, which is for example the exclusive importer of Nikka whiskies for Europe, has opened what it calls a temporary shop devoted to the Japanese whiskies. Japan has become in recent years a heavy weight of the whisky production and its whiskies have won medals year after year in the international competitions : In the last Malt Maniac Awards a month ago the trend was confirmed with Japan winning nearly half of the gold medals. And a couple of months earlier, Nikka literally triomphed at the International Spirits Challenge in London. Since they began taking part to the Malt Maniac Competition in 2006, Japanese whiskies won a disproportionately-high number of awards, proving to the sceptics (or simply to those who never tasted one of these whiskies) that Japan was a serious player in spite of their relatively recent history in this field. This has led the people on the Malt-Maniacs website to say that based on our experiences in the MM Awards it seems that the average Japanese whisky is fabulous ! and also : based on what we've experienced so far it would seem that the 'quality' of the average Japanese whisky has now surpassed the quality of the average Scotch whisky. They also address the price factor as while Scotch whiskies had their prices considerably raised in the recent years, the Japanese whiskies saw their prices become more competitive. I learned about this Japanese whisky shop through Chris at Nonjatta, the reference for anyone interested in Japanese whiskies. Chris Bunting is a Brit who lives in Japan and offers priceless insight in the Japanese whisky world, including sometimes on the little-known history of its origin. By coincidence, as I learned about this temporary shop (I heard that the temporary could last), our friend Junko from Osaka was staying in Paris for a few days as usual at this time of the year, bringing with her something that I ask her to buy in Narita or KIX each time she flies direct here. With the usual evildoers trying repeatedly to bring down airliners, we could even loose one day this allowance of tax-free alcohol in direct flights. We had dinner with Junko somewhere in Paris and I shot this picture of her with my coveted bottle of Nikka Single Malt 12 years Yoichi, price tag at duty-free Fasola at Narita : 3900 Yen or 30 €.... very good bargain especially compared with the listed price in the catalog of the Maison du Whisky : 84 €. Overview of Japanese whiskies by Chris Bunting. Or this one which may not be very politically correct : The peoples of the Mediterranean began to emerge from barbarism when they learnt to cultivate the olive and the vine. (Thucydides, Greek Historian, (c. 460-400 BC)). Pliny also said "In Vino Sanitas" (wine is health), and a Russian proverb says Drink a glass of wine after your soup, and you steal a ruble from the doctor. a Beer from Burgundy I had a casual beer with pizza the other day, that's not another pairing story and I just discovered this little-known beer in Burgundy. I'm not sure it can be found in Paris. It is made by the Brasserie Burgonde, it's an old brewery which went through different names. The facility is in the historic center of Vitteaux, a middle-size town in Northern Burgundy. There's been a time when Burgundy made also beers and Vitteaux had several active breweries in the early 20th century, maybe because the town had abundant, quality water. Nicolas Bretillon is the young man behind this brewery, he is a passionate artisan brewer and has studied through multiple experiences the crucial details (containers, raw materials) to make this velvety, smooth if strong beer. He uses barley malt, wheat, oats, hops, yeast and water to make these bières de Vitteaux beers, they aren't pasteurized nor filtered. The label states "goût évolutif" (the taste may change with time). The bottlings are mostly in 50-cl (with magnums too) and the rates are those of artisanal beers, 2,5 €. The beer on the picture (the only one I tried, but I'll buy other types when the opportunity shows up) had this smoothness and ontuosity that I like in beers, and there was exactly the right, light bitterness at the end of the mouth to balance the whole thing. The 7° alcohol don't show up really. Nice job. The label reads : Bière de Vitteaux Brune, Brasserie Burgonde, Bière du Pays de l'Auxois en Bourgogne, and also in small print : better drink before april 2011. Philippe Jambon, Ewen (Racines), Patrick Bouju and his wifeThe last edition of Buvons Nature was for me a great opportunity to taste wines from vignerons I knew and to discover wines from people I didn't know yet. On this picture, we're drinking a sparkling wine brought by Ewen of the wine bar/restaurant Racines. This was a high point of the day (but there were other high points, and I visited two days in a row...). All the vignerons at Buvons Nature vinify without using any additives or external yeasts, some even don't use any sulphur. The result speaks by itself i the glass and in the cherful mood of attendees who didn't often spit. __Griottes Ptite Gâterie, Vin deTable (2007) made with Gamay, Pineau d'Aunis and Grolleau. Very fruity mouth. Someone in the assistance asks who's also vinifying a fruity Grolleau, Pat answers Olivier Cousin. __La Griotte, Vin de Table (2007), Cabernet Franc & Cabernet Sauvignon. Elegant, beautiful nose. __ La Griotte, Vin de Table (2005) Magnum. The mouth is very gourmande. A bit fuzzy on the tongue. Intensity. 3-year elevage in casks, bottled for a year. 25 € for a magnum. A steal. The Petite-Gâterie magnum costs 16 €. Grand Cléré. I visited François Blanchard of Le Grand Cléré a couple years ago, he is a free-wheelin artist who is making beautiful wines in the Loire. __Le Grand Cléré 2007 White. Sauvignon. 2-year elevage in old casks. Nice richnes in the mouth, very surprising for a Sauvignon, aromaticly. Zero SO2 added, either during the vinification or for bottling. No filtration. He says it's maybe better to carafe it. Beautiful wine indeed. 4 hectoliter/hectare yields. 35 €. __Le Grand Cléré Red (forgot to note the year, probably 2007). 100% Cabernet Franc. Unfiltered. Superb nose. Pepper. That's simply beatiful. 13,5 Euro. Very good value. A wine with a nice personality. I went to Patrick Bouju's La Bohême table [the guy on right on the picture above, standing near his wife]. His estate is in the depth of the Auvergne, which is part of the Loire. There are really beautiful wines being made in that region, I'm thinking to Mauprthuis' wines that I was happy to drink several times. Patrick Bouju works also on the most natural and non-interventionist way with grapes growing at an altitude of 450 meters. His vineyard surface is 2,2 hectares and he plans to grow to 4 hectares. __La Bohême, The Blanc 2008. Chardonnay moelleux (semi-sweet). Very nice year for the whites. Harvested october 15th. This bottle costs 7 € at the winery. The aromas are fruity on this vintage when usually he gets austere Chards. In 2008 he had these cold nights which added to the fact that his vineyards are not exposed full south. Sugary side in the mouth. I prefer the nose here. La Bohême Pet Nat (natural sparkling). Same base as the still 2008. He made 300 bottles of it only. Sugary mouth. This is his second Pet-Nat and he looks to lower the sugar in this wine. Disgorged 15 days before this tasting. __La Bohême Gamay d'Auvergne (2007) Vieilles Vignes. 18 months in casks. Bottled in may 2009. High density in the vineyards : 12 000vines/hectare, the rows are very close to each other, a regular tractor can't pass in-between. Beautiful nose of clafoutis (morello-cherry cake). He vinifies through long macerations in resin vats, 80% of the grapes are destemmed usually. The wine shows a nice texture in the mouth. Costs 9 € at the estate. __La Bohême, Suzanne, Table Wine (white, Chard - 2007) demi-sec (semi-sweet) Bottled 15 days before the tasting. Zero SO2. The wine is a bit too warm but still shows very nicely. Well balanced with acidity. Only one cask of it. Catherine VergéGilles & Catherine Vergé in Viré Clessé : Here, it's simple : zero SO2 on all the cuvées, they're both allergic to SO2 and decided to get rid of sulphur addings right away. There's no casks in this estate (or maybe only in one instance), only regular vats. __Domaine Vergé Viré Clessé (white) Le Haut de Boulaise 2004. Chardonnay. A bit of gas on the nose. Then I find citrus notes. In the mouth, this wine is ample and rich. Un filtered, unfined. It's a bit turbid. Catherine says that their wines often face refusal at the Appellation Commissions for being atypical. 13,5 €. __Domaine Vergé, Viré Clessé Vieilles Vignes 2004 (white). Vinified in enamelled steel vats. These wines take their time, she says, they only bottled the 2005 recently. Very neat wine, so different from the previous white. This Chardonnay is very mineral, she says, because of the clay limestone soil of the terroir. 14,5 €. __Domaine Vergé, Mariage Blanc Vin de Table (2004) also a white. Beautiful freshness on the nose. Mouth less balanced though. 6 gr residual sugar here, she says the other had about 4 gr. 12 €. __Domaine Vergé, Vieilles Vignes, La Balaise, Vin de Table (2005). The fine print on the label reads "Lot 0509", means vintage 2005, bottled in 2009. Very long elevage indeed. Yields : 20 ho/ha. The mouth doesn't seduce me much here. B. on the opposite likes what she finds is a neat mouth. That's a difference in appreciations...13,5 €. __Domaine Vergé, L'Ecart, Vin de Table (2005). Lot 0508 (bottled in 2008). This wine was refused the Appellation. Very clear wine for an unfiltered one. Very pleasant wine in the mouth and to swallow, it's hard to believe that it was barred from the AOC. 26 €. __Domaine Vergé, Viré Clessé 2001, Selection 216. This wine is vinified in a 20-year-old cask (with a 216-liter capacity).b The wine hee comes from a climat named Baclot. What a nose ! Very happy (the right word) wine, a pleasure in the mouth and down the throat. 36 €. __Domaine Vergé, "Elevé au Grand Air", Vin de Table. Elevé au grand air means free range in French, we use this expression for free-range chicken for example. The message here is that the wine has been in contact freely with the air, it's an oxydative, veil-wine style. They did that without using a cask : they have a 2000-liter vat of which they opened the lid a couple of times according to the planet positions and it reproduced the veil effect on the wine. This wine was actually a special demand/order made by Cyril Alonso. Beautiful, oxydative nose, for those who like them. The mouth is magnificent and unexpected. Beautiful experience. Jean-Pierre Robinot kissing an admiring visitorI then tasted a few wines from Elise Brignot, a woman who made the jump to start a winery in 2005 in the Loire on 7,5 hectares. She also doesn't use lab yeasts and until now no sulphur. __Elise Brignot, Oui mais Non, Vin de Table. 50-year-old vines. Chenin Blanc. 12,5 €. Beautiful nose, the mouth is lovely too here, balanced, a true pleasure. She says her bottles can be found in Paris at the Caves de L'Insolite, the Sanglier en Bottes de Cuir, and at the Chapeau Melon (see my Paris Cavistes page). __Elise Brignot Les Poires Molles, Pet-Nat (natural sparkling) 2005. 3 years in a 3-year-old cask (220 liter) of which one year without any topping-up. 13,9 €. 9 gr residual sugar. Crown cap here too. 2/3 Chenin Blanc and 1/3 Chardonnay. On the nose, the aromas are particularly complex, she says it has to do with the 3-year elevage. Elegant, gourmande mouth with a light oxydative feel. A pleasure. Elise Brignot, Moelleux, Vin de Table (2005). 37,5 cl with cork held with a cute thin wire-cap (no foil wrapping around this wire cap). 25 €. Color : onion peel. Intense nose withb oxydative notes. Another pleasure wine here, delicious sugary feel in the mouth, very refined. Zero SO2 like the rest. 200 gr residual sugar here with a nice freshness. She says that there was 26° potential. She made only one cask of this wine. __Robinot Fête en Bulle, Pet-Nat (natural sparkling) 2009. 10 . Fruits, citrus, orange notes. Orange peel too. Nice. __Robinot, Les Années Folles Pet-Nat Vin de Table. A sparkling made with Pineau d'Aunis, 11 €. Lightly rose color. Sucrosity in the mouth. Short mouth but pleasant. __Robinot, Jasnières, Le Charme du Loir 2006. 15 €. Beautiful nose. Oxydative feel with a nice freshness overall. __Robinot Les Quatre Vents 2004. White (Chenin). Just take the nose, it's such a pleasure here... Also a light sous-voile feel due to the extremely-long fermentations at Jean-Pierre Robinot. His wines are known for having been so beautifully accustomed to the oxygen during their elevage that once the bottle opened you can ge back to it a week later and it will be different but wonderful. Incredible greenish reflections in the wine. Aromas of Calvados, says B. Also marsh-mallow. The nose is fresh and neat. 32 €. He says it's been topped up now and then but he left a lot of freedom to the wine. The wine is really very classy, a pleasure to swallow. __Robinot Les Quatre Vents 2005. 35 €. 36 months elevage and one year in a vat. Bottled a year ago. A quasi_Jura oxydative wine. Superb. There's an amber something in this wine. 40-year-old vines. Also nice greenish color. __Robinot Regard du Loir Vin de Table (2006). 11 €. A red now, 100% Pineau d'Aunis. From a theorically Coteaux-du-Loir Appellation and vines of different age (40-, 80-, 100 year-old). Clear wine, thisis Pineau d'Aunis. Very nice peppery mouth indeed. 24 Month elevage here. Zero SO2 at all stages(vinification, bottling). The empty glass releases other aromas of underwood, mushroms, makes me want more. 11 e is a bargain I think. __Robinot Nocturne Vin de Table (2006 - red). Pineau d'Aunis. 18-month elevage. Dark wine. Refined nose, encense notes. 80-year and 100-year old vines. __Robinot Symphonie du Temps 2004 (white). I tasted this one on the second day. Old vines, 2 casks per year made of this. 32 €. Very very beautiful, aromas of dry fruits, Lyz (who joined) finds vanilla notes too. Very nice balance in the mouth, lots of gourmandise... Importer Yoshio Ito with Philippe JambonI remember my visit at Philippe Jambon on a rainy summer day a couple of years ago. The motorcycle trip to his Beaujolais village was not a very pleasant one but once there I got very good surprises, including the chance to taste old white sweet wines from glass marie-jeannes with the company of Pat Desplats from Domaine Les Griottes and a couple of cavistes from Toulouse. This sweet wine had never seen any SO2 and left such a beautiful mark in the mouth. I also had an interesting insight on the subject, Pat Desplats being also one of extremely rare vintners who make sweet white without any SO2 additions. __Philippe Jambon, Maconnais La grande Bruyère 2005. Chardonnay. 19 €. Very intense in the mouth. Very solar vintage, he says, adding that it's a bit closed right now. __Philippe Jambon, Maconnais La grande Bruyère 2003. White flowers aromas. 22 €. __Philippe Jambon Une tranche (red). Négoce wine : he bought already-made wine here, that was not premeditated, he was supposed to buy cement vats to a colleague but he showed up at the winery the vats were still full with wine and the colleague (who is farming organic and vinifies without additives too) said, just take it all...The wine in there was Brouilly and Côtes de Brouilly 2007 but it's labelled as Table Wine like the rest. Nice aromas of small red fruits. __Philippe Jambon Les Batailles 2007 (red). Nose with reduction, gaz. Bottle opened not long ago. Yields of 10 hectoliter/hectare, that is a small yield indeed...The vintage was desperately rainy (I know too well, that's when I visited on my motorbike...). 19 €. __Philippe Jambon Roche Noire, Table Wine (2006). 15 €. Very beautiful nose with fruits notes. The mouth feel is on the acidulous-candy side. He says that there is the unmistakable "Roches Noires" (black stones) effect here, with a striking minerality, the vineyards growing on a soil where black rocks surface everywhere. Nice wine. Fanny SabreI was very happy to have the opportunity to taste Fanny Sabre's wines, as I heard about her taking the reins of her family winery, and having visited her cellar in Beaune with Philippe Pacalet at the time when he vinified part of the Domaine Sabre wines there. She is in charge since 2006. __Fanny Sabre Aloxe Corton 2007. Clear, turbid wine. I like the nose, intense. Pleasant, fruity wine. Small vintage, she says. Very supple wine. Strawberry-jam aromas. Made out of a very small vineyard surface : 5 ouvrées. 24 ouvrées make one hectare, this old surface unit measure is the surface that a worker could handle in a full day in the past. __Fanny Sabre Beaune 1er Cru Les Chouacheux 2007. Beautiful, structured mouth. Bottled last march. Wine with a future. Fanny Sabre says that she makes many different wines, each of her about 18 cuvées making often only 2 or 3 casks each. __Sebastien Riffault, Sancerre Akméniné 2008. Ripe grapes on the nose, with Muscat notes. Lyz feels macerated-fruits aromas with earthy notes , underwood. Nice wine. 12-months elevage. 17 €. __Sebastien Riffault, Sancerre Auskmis 2007. Made with grapes that grow on a side of the Akhméniné vineyards. Limestone soil. Old vines. He says that he brings the grapes through longer maturations here. 18-month elevage. The taste is more on the dry-fruits side, dry figs for example. Higher alcohol feel here, more powerful wine. 20 €. __Sebastien Riffault, Sancerre Skeveldra 2007. Skeveldra means stone éclat in Lithuanian (Sebastien's wife is from this Baltic State). The soil of the vineyard is particularly thick with flint stone (silex). Very mineral Sancerre indeed, with still this particular richness in the mouth.............Michel and Béatrice Augé were also at Buvons Nature and that was an opportunity to taste their wines, which I hadn't for long. Michel Augé grows grapes on biodynamie in the Cher valley, close to CRB, Noëlla Morantin and Junko Araï (see Béatrice Augé on the picture on the left). __Les Maisons Brulées, le Herdeleau, Vin de Table (2008). Gamay, Pinot Noir & Pineau d'Aunis. The blend was made right at the grape/harvest stage. Bottled the previous month. He says that at the Angers wine fair it will be much better to taste. __Les Maisons Brulées, les 30 Lunes, Vin de Table (2004).Semi-sweet wine, he made 2 casks of it but has only 6 magnums left (when the tasting took place). potential 25 °. No SO2 added herte. Very beautiful nose, freshness. Quite an extraordinary mouth, powerful and refined, with aromatic intensity. Good acidity so that the residual sugar doesn't feel much. 30-month elevage plus 1 year and a half in bottles. He says it goes with almost anything except salad dressing (because of the vinegar). 40 € for a magnum. A bottle we were supposed to drink What you see on this Christmas table is a Chateau d'Yquem Lur-Salures 1953 that we were supposed to open and drink this Christmas. That's one of the last bottles that my grandfather left us and that I've been keeping in a good cellar for years. Alas it was not always kept in the proper conditions and when I got it it already had some wine missing and this strange orange color. Whatever, my mother had thought this could be great to drink it now and see what it gives, to which I agreed. But at the last minute there was some other members of the family who thought it was better to keep the bottle that way for now, to which I complied, both ways having its sense (And on D-day, it would be wise to use the proper glasses, these traditional French glasses being not the best suited to experience the aromas). It's a debatable question anyway and we may open it at last one of these days when we're all together. This is an important question to think about : is it good to keep forever bottles with a cult status or risk opening them and finding that the wine is disappointing, and loosing altogether what can be seen as a valuable investment and asset. I think the first option makes more sense than the second, what the heck if the wine has lost much along the years... I've heard about someone a few years ago who had spent years acquiring expensive bottles of wine but his close family noticed that he never or rarely opened them. Who wants really to follow this path ? I didn't take notes of all the wines we had, but I remember one which was an unexpected surprise, it was a Graves, Clos du Colonel which I had bought in Saint Emilion a few years ago as a joke to drink with my brother in law who is in the military. I stored it (I have another bottle) mindlessly for years in the garden shack in Paris after forgetting about it, and believe it or not, it was quite good and didn't hint of its unproper cellaring conditions. The Clos du Colonel is made by Hélène and René Laffargue in Beautiran. French State TV report about additives and chemical residues in wines (Part One)That's an old story now but I just found recently the video (we don't watch TV). On the whole, that's a good and informative report on the question of additives in wines. The report is tailored for a public unaware of the winemaking world and the journalists who wrote the text of the off-voice sometimes don't seem to catch up essential differences with the nature of products they're talking about, like they put as the same level the chaptalization and the other additives. They also say at one point "To sell their wines at a higher price, some wineries put additives in their wines", that's a strange statement, and quite wrong if they mean that there is a correlation between additives and prices : many, even most, of the most expensive wines in France are made without using a single additive (except sulphur, but in ever smaller volumes). The reality is that if money is central in the use of additives, it's because the mid-level commercial wineries want a square product ready in time for the market, and the additives are the easy shortcut for that. Whatever, some people decried this TV report as endangering the French wines by scaring off the consumers, but this is about the practices of business-minded wineries worldwide and the wines that were analyzed for residues came also from many other countries than France. See on the same subject this study [Pdf] made by the non-profit group Pan about the pesticide residues in commercial wines from different countries [there's no border in this field, New World or Old World share the burden - And wine made from organic grapes make the difference if they're been chemical-free for a sufficient number of years]. This eye-opening report begins by a tasting at La Robe et le Palais, a wine restaurant serving natural wines. Further, after watching how mass-bottlers make their wines, you will meet Jean-Pierre & Chantal Frick, who work in biodynamie in Alsace and don't use any additives (and important, make great wines this way).............The second part of the TV report (watch Part Two here) has first a chaptalization story which is I think treated the wrong way by the French State TV channel, with hidden cameras and a sensational feel, as if buying sugar was akin to buying drugs : the vigneron could have simply sent his wife buy sugar with cash in the supermarket, and the use of intermediaries to buy sugar and chaptilize a bit more than what is allowed by the AOC rules is really a side issue here. The really interesting part of this second video report is about pesticides residues found in Champagnes and wines, a lab study ordered by the TV team proving that commercial wines from different countries found in the French supermarkets (natural, organic wines were not included among the samples) have high residual traces of pesticides. See the funny part where the UIPP representative (the pesticides lobby) tries in the Salon de l'Agriculture to make people believe that a wine made out of non-pesticides-sprayed grapes smells vinegar (reminds you something ?.... ;-) ). Further, an interesting interview of Jean-Marie Balland who after working for years as a salesman/pusher for the pesticide business changed his mind and denounces the policy of the chemical industry to incite heavy use of pesticides in the vineyard. And at the end, you go to Champagne with Lydia and Claude Bourguignon as they visit a vigneron there who wants to convert to organic farming. Claude Bourguignon is a world-known specialist about terroir, soils and organic farming and he can prove that chemical products kills terroirs and soils. Mark Williamson tasting Jan & Caryl Panman's winesWe went to the Grand Tasting last december. Bettane & Dessauve's wine tasting event in the basement of the Louvre in Paris is an opportunity to taste wines from some of the best French estates (plus a few Italians). I don't think that two days are enough to have an overview of all the wines , and having to go to the Loire for a hunting party, I stayed only a morning there. We stopped at Chateau Rives-Blanques's stand to taste their wines (Mark Williamson of Willis' wine bar stopped there too as we were leaving). Jan & Caryl Panman, the owners who are Dutch, bought this estate in the region of Limoux 9 years ago. See the Wine-Doctor's review of the estate. Limoux is known for its sparkling (Blanquette) which has been made for a very long time : a document dating from 1531 that is kept in the archives department of the nearby city of Carcassonne tells about the higher price of the Blanquette de limoux (the sparkling) compared to the still wines then... The Blanquette de Limoux is made with 90 % Mauzac, the rest being Chard and/or Chenin Blanc. Since 1990, the crémant (another type of sparkling) is authorized in the Appellation, with Chard (max 60 %), Chenin Blanc (max 30 %), Mauzac or Pinot Noir (10 %). 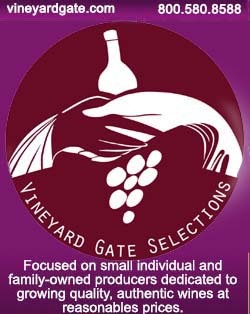 The Appellation has been moving upward in the recent years thanks to the coop and 5 or 6 estates which are investing in the quality. Rives-Blanques is known for its diverse and qualitative cuvées, all whites, single-variety or blends. __Rives-Blanques Crémant de Limoux rosé 2007. Fresh, light. Quite woody. 8,8 €. __Rives-Blanques Vin de pays, 90% Chardonnay, 10% Chenin Blanc. Pleasant nose and mouth. 4,8 €. __Rives-Blanques Cuvée 100 % Mauzac. I like this mouth, quite elegant wine. Fermentation & elevage in old casks. 8,95 €. __Rives-Blanques Dédicace Limoux 2007, white again. 100 % Chenin Blanc. 8,95 €. Sorry, no notes. __Rives Blanques La Trilogie, Limoux (white) 2008. Mauzac, Chard, Chenin Blanc. Nose with flower & fruit aromas, Williams pear. 15,65 €. Asked about the fermentation yeasts, they say that they use neutral yeasts like Champagne yeasts. __Rives Blanques Cuvée de l'Odyssée Limoux (white) 2006. 100 Chard. Intensity in the mouth, 14°. Powerful wine. Picked later in the season. 30 % news casks. Elegant wine to eat with. __Rives Blanques Xaxa vendange d'Hiver (winter harvest) Table Wine (2004). 60 % Chenin Blanc, 40 % Mauzac. There's no tradition for late harvest around. Jancis robinson, who wrote recently in the FT a piece about this great unknown sparkling region (read Jancis Robinson's piece), liked this cuvée very much. fresh wine, beautiful presence in the mouth. Dry figs aromas. 12,7 €.............We liked also very much what we tasted at the stand next to Rives-Blanques, the one one of the Mas du Soleilla, a 20-hectare estate located on the La Clape rocky peninsula near Narbonne in the Languedoc. The yields are on average 25 hectoliter/hectare. __Mas du Soleilla, Sphynx 2008 La Clape. White wine. Majority Bourboulenc with Roussane. 2/3 of the worlds's Bourboulenc grow in the AOC La Clape area. Jurassic, Trias soil. No casks for this wine. Very elegant and relatively powerful in the mouth. __ Mas du Soleilla Les Chailles, La Clape 2007 (red). Grenache with a bit of Syrah. Vat. Nice nose with fruit notes. A bit of reduction. Neat wine, not too powerful, with beautiful tannins. Balanced. He says that the soils makes it all. 12,9 €. __ Mas du Soleilla Les Bartelles, La Clape 2007 (red). The young guy at the stand is not the vintner himself but he is very knowledgeable and cheerful about the wines. He says that even if the vineyards don't grow at the altitude of the Côte Rotie, it can compete easily in a blind tasting with the CR. Lots of freshness and acidity here, this is a Syrah, but with an aerial side. The wood is felt in the mouth. 16 €. __ Mas du Soleilla, la Clape white 2007. Fresh nose, subtility in the aromas with citrus notes. Elevage in wood. 15,8 €. __ Mas du Soleilla Clos de l'Amandier, La Clape 2006 (red). Merlot 70 %, Cabernet Sauvignon 30 %. B. says it's on the Pyrasin and peppery side aromaticly. Jammy fruits too. That's a veeery beautiful wine, with a supple and long mouth. 32 €. Alice Feiring published in FranceAlice Feiring's Book The battle for Wine and Love or "How I saved the world from Parkerization" has just been published in France by the Editions Jean-Paul Rocher. In La Bataille du Vin et de L'Amour, Alice Feiring will explain her passion for real wines and natural wines to the French public. She explains on the notes on the cover how after considering at the beginning the title of the book as being just ironic (as a simple writer, she never had the pretention to change the world), she now thinks that her voice helped open a debate which is taking momentum among the wine lovers. Link to her page on the publisher's website. Link to the Amazon's page for the book. I went by the same Japanese whiskey shop in Paris recently to. Far too tempting for me to resist a look inside! Great place! Can I also use your picture with lovely Japanese lady?